I had the guys over the other day for a dinner party. I wanted to keep it simple, but still have a decent menu. So instead of making a variety of cocktails, I decided to make sangria. The secret to a good sangria is the wine. 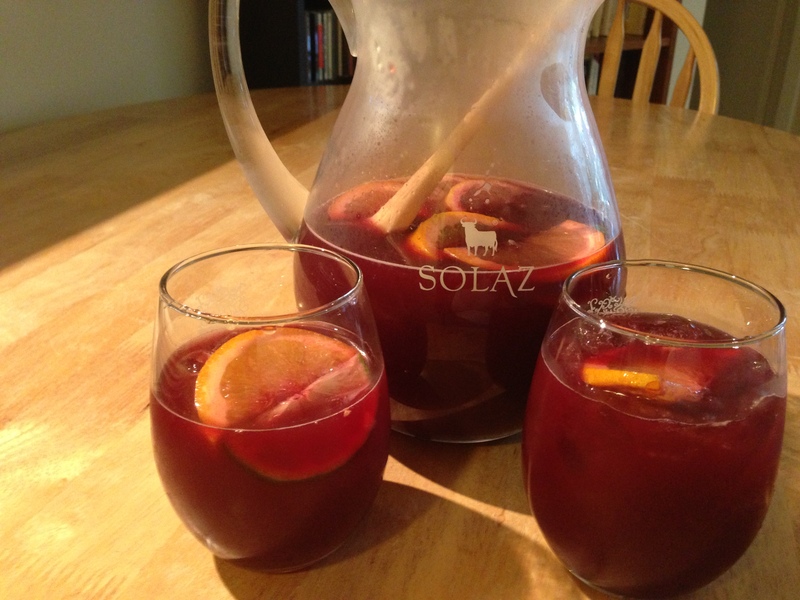 For this recipe, I chose a bottle of SOLAZ Tempranillo Cabernet Sauvignon. This bottle retails $11.95 at any BC Liquor store. This Spanish wine comes from the Tierra de Castilla region. Blessed with rich clay soils and an unique microclimate and sunlight, it produces a wine that is elegant, clean and brilliant, with an elegant, fruity, bouquet. Add all ingredients into a pitcher and gently stir. Refrigerate for 4-10 hours. Add ice and stir gently before serving. This recipe is easy and creates a delicious, crisp, cocktail. You can pair it with any white meat, or Mexican dish.